The Parma Show sees the debut of the Fiat Stilo Multi Wagon Van, a new concept in light commercial vehicles. It offers all the stylistic elegance and handling of the Multi Wagon combined with all the practicality and load capacity (no less than 1600 litres) of a true workhorse. The space is only to be expected in a vehicle used for light haulage, but you will be pleasantly surprised by the innovative solutions and systems that ensure the vehicle's occupants enjoy well-being, driving comfort and safety. Because the Fiat Stilo Multi Wagon Van is still a Stilo and, like the saloon, is self-evidently a no-nonsense good-looking unit with stacks of personality and attributes that are now permanently encoded in the DNA of any Fiat: innovative design, cutting-edge technology available to all and clever solutions to make life simpler and better. The Fiat Stilo Multi Wagon Van is destined to replace the Fiat Marengo, a vehicle that sold more than 23,000 units throughout its life cycle. The new model is proving to be one of the most comfortable vehicles in its segment: 4.51 metres in length, 1.75 metres in width, 1.57 metres in height with a wheelbase of 2.60 metres. The generous load compartment offers a working length of 1682 millimetres and a height of 945 millimetres, while the width ranges from a minimum of 1137 mm (between wheelarches) to a maximum of 1442. The load compartment, separated from the passenger compartment by a steel partition, is lined by a black PVC carpet and fitted with 6 goods anchorage hooks. The rear side windows are darkened. The payload varies from version to version: from 460 to 570 kg including the driver. Fiat's new van also comes with a luggage compartment that is easily accessible from side and rear due to a load threshold just 537 millimetres off the ground. The exterior features taut surfaces and architectural shapes with strong visual impact. The car gives an impression of sturdiness and solidity that is evident in a broad front with its wide, protective bumper that conveys a feeling of prestige and safety. This impression is reinforced by a waist-line muscle that ripples along the side of the car before dropping to the bumper and ending at the numberplate. The model's strength lies in its fortuitous combination of style and practicality. Examples include: an imposing rear bumper that gives the vehicle an impression of great solidity and a tailgate with a practical overhanging moulding on which to momentarily rest packs or parcels. The tailgate also opens with extreme ease due to a convenient central handle located beneath the number plate. The model can also be fitted as an option with an innovative opening rear window that is operated by a switch located above the numberplate lights. Horizontal tail-lights make the Fiat Stilo Multi Wagon Van immediately recognisable and give it a greater sense of solidity. The interior of the new model reveals innovative design, material quality and a wealth of features that add up to a welcoming, comfortable environment that significantly improves life on board. The well-proportioned interior lines are effectively offset by the exterior and complemented by generous glazing for a well-lit environment and outstanding passenger space. Everything is made still more comfortable and practical by numerous compartments distributed throughout the facia, console and door panels. The Stilo Multi Wagon Van comes with two 80 bhp and 115 bhp 1.9 'Common Rail' turbodiesel engines, both combined with a 5-speed mechanical gearbox. These two spirited power units assure great flexibility and driving satisfaction while ensuring good fuel economy and respect for the environment. The 80 bhp 1.9 JTD delivers 59 kW at 4000 rpm, and a torque of 196 kgm at just 1500 rpm. When equipped with this engine, the new commercial vehicle reaches 170 km/h and consumes 5.6-l/100 km over a combined cycle. The 115 bhp 1.9 JTD differs from the 80 bhp version due to the presence of an intercooler and variable geometry turbine. It delivers a maximum power output of 85 bhp at 4000 rpm and offers a maximum torque of 255 Nm at 2000 rpm. In this case, the top speed achieved is 190 km/h , and fuel consumption is 5.6 l/100 km. 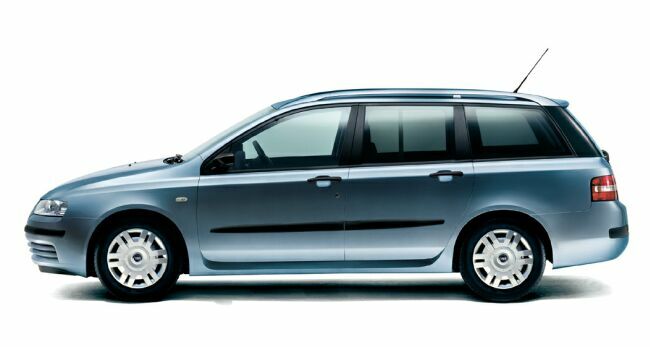 When it comes to comfort, the Fiat Stilo Multi Wagon Van is unequalled in its segment. Firstly, the user-friendly driver's cockpit is fitted as standard with a height-adjustable seat with lumbar support. The model also offers a raised driving position to benefit ease of access and mastery of the road. The suspension system ensures great driving ease and precision, outstanding roadholding and the best possible passenger comfort. The two efficient, tried and tested layouts used work very effectively due to the attributes of the chassis. An independent MacPherson system is used at the front. At the rear, the car is fitted with an interconnected wheel suspension with a torsion bar. This layout assures outstanding handling, satisfactory load capacity (up to 570 kg) and a considerable reduction in levels of noise and vibration transmitted to the passenger compartment. The Fiat Silo Multi Wagon Van comes in two specifications: Actual and Active. The former offers as standard ABS + EBD, two airbags and a Fiat CODE II antitheft system. Other standard features include Dualdrive electric power steering, height-adjustable driver's seat, steering wheel with height and axial adjustment and electrically-controlled heated door mirrors. Active versions offer everything in the Actual package plus certain features that vary with the market. In Italy, for example, standard features include a radio and climate control system. The new model is due to go on sale in Italy this month, while the four-door version with N1 homologation (truck) will go on sale in May.